When Twitter opened up its developers conference, better known as Chirp, they started out by releasing a ton of stats on Twitter. 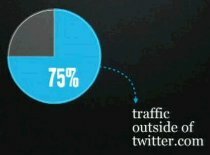 And it was that last statistic that really caught my attention – 75% of Twitter traffic comes from outside of Twitter.com. So out of that 180 million unique visitors, 75% (or 135,000,000) of the traffic that is interacting with Twitter isn’t even coming to their primary website, and only 25% (or 45,000,000) is actually visiting the primary Twitter.com domain. First, I see these numbers as an indication of the future of the Internet as a whole. Everything about the web is being migrated toward being mobile – just look at the recent iPad release. And since “mobility” is the future of the web, apps are the dominant portal to accessing the information you want and need while on the run. Twitter is a true example of how people want to be mobile, and how “apps” are becoming the dominant vehicle for delivering that information on mobile devices. I also see this statistic – 75% of people using Twitter outside of Twitter.com – as a major obstacle to Twitter’s advertising revenue business model. Running ads on Twitter.com doesn’t make sense to be their primary focus because the majority of their users aren’t even coming to the website. So that means advertising in the Twitter streams themselves. But when you start sending out tweets that are “spammy”, that starts to upset people and could become a factor in people no longer using Twitter. So it’s a dilemma for sure! No doubt that Twitter is growing and is widely used by people, but how to actually make money from it – that’s a whole different ball game all together.